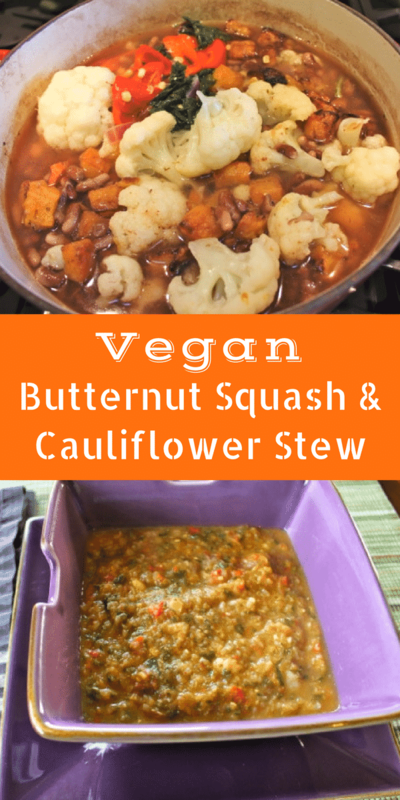 This Vegan and Low-Fat Butternut Squash & Cauliflower Stew is one of the healthiest dishes you can make. 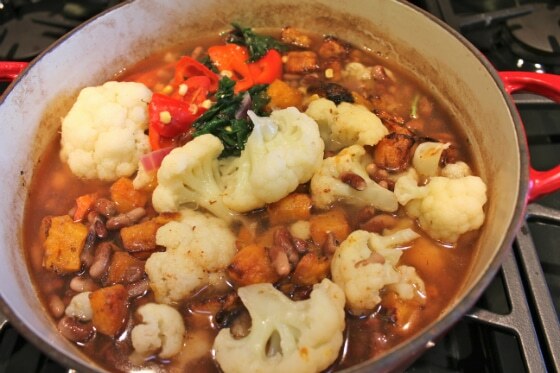 With plenty of vegetables, plus greens and beans, it’s the world’s healthiest stew. I think fall might be my favorite season. I love the coolness in the air and the transition to warmer clothes. As a homebody, I like the shorter days that force me indoors to cook, read books or just cozy up to the fireplace. What I love most of all about fall is the introduction of fall fruits and vegetables. 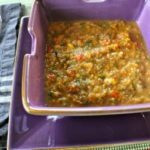 It was really warming and nutritious and made about six large servings, most of which went into the freezer for future meals. You could say I’m stocking up for the winter? 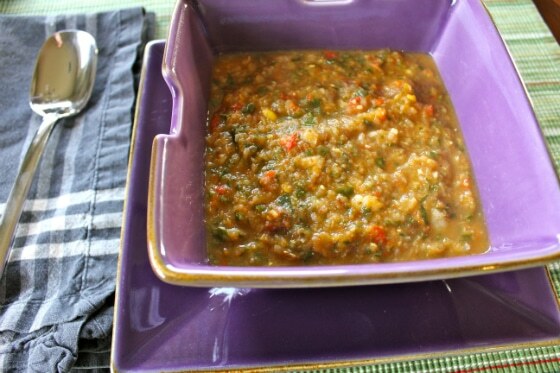 In a large pot, water-saute onion, garlic and peppers for 3-5 minutes or until soft. 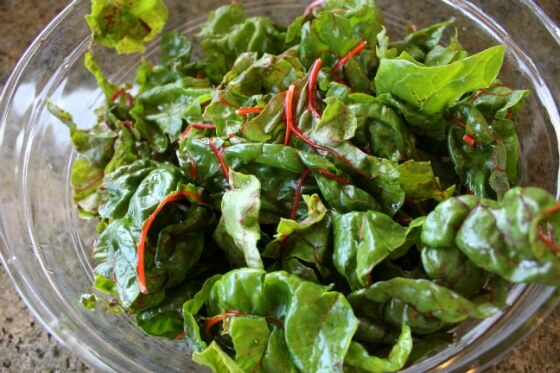 Add chard and sauté until wilted. 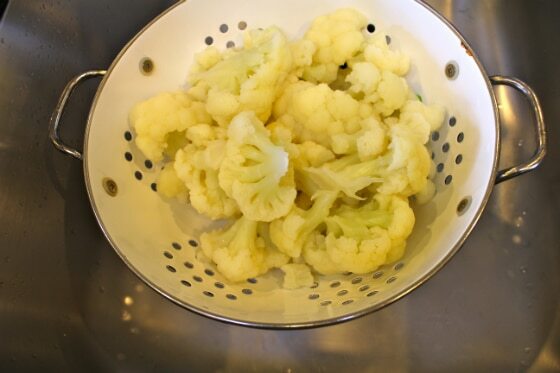 Add beans, squash and cauliflower and cover with water (about 6 cups). Bring to a boil and then turn heat down to medium and simmer for 15-20 minutes. Use a hand-immersion blender to smoothen texture but keep it chunky. This looks absolutely mouthwatering; I love that the end result looks so textured and soul-satisfying. Bookmarking this! It looks great! I don’t like cauliflower, but I can imagine that it is easily replaced by another vegetable (another reason why I love soups). Sometimes I’m jealous that you had the heart to change your profession. I’m becoming more and more interested in food, nutrition and health and would love to know more about it. I always try to be grateful for what I have, I think it’s something about the human kind to just want that tiny bit more ;). I’m happy with where I am right now, I think it’s something for the future (or maybe I’ve changed my mind by then). Anyway, good luck with it! I love using pumpkin in the fall–in everything! Thanks Lisa! I’m actually not a huge fan of pumpkin, unless it’s in a pie of course. But, I do love all of the other squashes. I have a question….I am not a fan of fresh squash as I find the thick skin hard to deal with. How do you remove the skin? peel it? cut it away? I want to try this, but minus the cauliflower LOL Not a fan. Hi Robyn, if I’m in a hurry, I’ll buy the pre-cut butternut squash and I always buy the canned pumpkin. To prepare a butternut squash, I use a vegetable peeler to cut off the skin. Then, I use my biggest knife to cut it in half to get out the seeds. Then, I cut it into chunks. The kabocha squash is easier to prep because the skin is edible (and delicious!). For that one, I just cut it in half, empty out the seeds and then cut it into slices. I usually roast squash in a 400 degree oven for 30 minutes or so, usually in a little bit of coconut oil. YUM! Hi Carrie…I made this last night and it was AMAZING!!!! So good, so healthy….perfect for the first cool night of autumn!!!! I am SO happy there was enough for dinner tonight too!!! How scrumptious this soup looks! And chock full of fall veggies. Mmmm… I love cauliflower, though typically not in soup, but I think that blending it up like you’ve done will solve that (like you told Sara). Thanks Helen! Let me know if you try it and what you think. 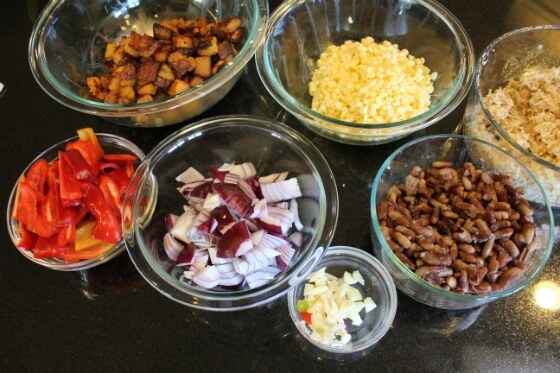 Hi Mandy, you would want to use cooked beans in this recipe, whether canned or cooked from scratch ahead of time.